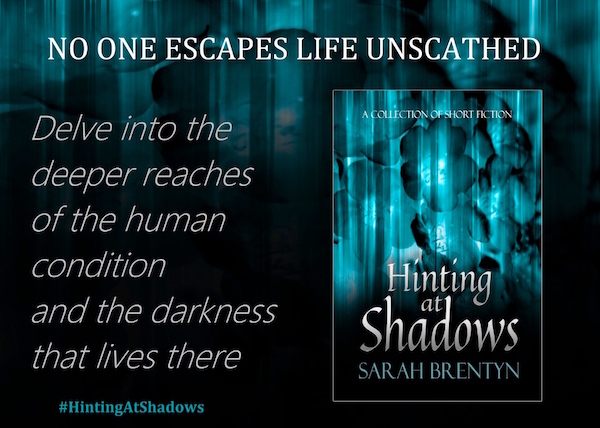 I’m delighted to be spotlighting Sarah Brentyn’s collection of short and micro fiction ~ Hinting at Shadows ~ and sharing two extracts from the book along with my review. Not even when they took her to a real house with her own bedroom, a kitchen that had food in it, and two grown-ups who tucked her in at night. She stared at the empty album wondering again what kind of flower decorated the cover before her mind tried to find the word for the color then thought about the emptiness again. Round and round like the seasons. In and out and back again. Peach. It was peach, that hue. Pink. And the flower, a rose. Or carnation. Daisy. The emptiness. Pink. Flowers. Like spring. With things that are alive trying to sprout from things that look dead. Hinting at Shadows looks at the darker side of humanity with evocative and fascinating descriptions of fractured minds, disintegrating relationships, and encompassing the spectrum of emotions, from sadness, loss, regret, hope and much more. Each piece of fiction, as the title suggests, hints at, or gives a brief glimpse of, the shadowy places in the minds and emotions of the individuals. The author’s haunting prose very cleverly invokes strong images with the minimum of words. I’ve had the book a few days now and, rather than reading it straight through, I keep dipping into it and so am able to appreciate a few pieces at a time. Each time they have the power, even if I’ve read them before, to shock, sadden, give me chills, make me think and even smile on occasion. Sarah Brentyn delivers something quite different, written beautifully with intuitive understanding and the ability to generate an emotional reaction. She hopes to build a vacation home in Narnia someday. In the meantime, she lives in New England with her family and a rainbow-colored, wooden cat who is secretly a Guardian. I wrote my first story when I was nine years old and have never looked back. My work has appeared both online and in print in lit mags, newsletters, websites, newspapers, and anthologies. I have a master’s degree in writing and have taught all ages from Kindergarteners to adults. When other girls dreamt of being a ballerina, I dreamt of scribbling my thoughts in a notebook and turning them into a book. I bleed ink. Thanks, Tess 🙂 I love the cover too. I hadn’t known you were going to review it, as well, so that was a most pleasant surprise. What a beautiful look at these pieces. I truly appreciate your kind comments and the thoughtfulness that went into your review. I am so glad you enjoyed it. ❤ Thank you! Thanks, Shelley 🙂 I’m loving it too and get more out of the stories that way. What a wonderful spotlight! Sarah is a very talented writer! Thank you, Barbara 🙂 and yes, she really is. Fabulous extracts and love the review. The book has a mesmerising cover, too. Those extracts are great and made me buy the book 🙂 Love the cover too.